Lace Hendricks is homeward bound, four hundred highway miles from the best night of his life. There's an epic graduation party brewing, his girlfriend will be there, and they've got a private bedroom with their names on it. when his '93 Buick breaks down in the middle of nowhere, Lance is sure he'll be back on the road in no time. After all, he's the high school valedictorian. First chair trumpet player. Scholarship winner. Nothing can stop Lance Hendricks. But afternoon turns to night, and Lance ends up stranded at the Trainsong Motel. The place feel ominous, even before there's a terrible car wreck outside his room. When Lande rushes out to help, the townies take notice. 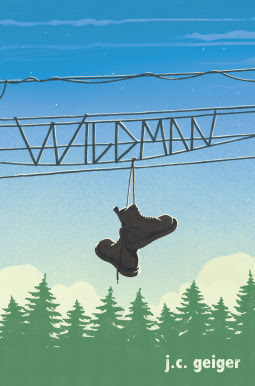 They call him Wildman, and an intriguing local girl asks him to join in their nighttime adventures. He begins to live up to his new name. As one day blurs into the next, Lance finds himself in a bar fight, jumping a train, avoiding the police. Drifting farther from home and closer to a girl who makes him feel a way he's never felt before - like himself. It's a nice quick read, not to hard to get through. I did feel myself wandering off all the time. I kept doing other things than reading this book. My attention was not there, that's the reason I gave the book 3 apples. Cover and story: You think you've figured out the cover pretty quick, but you don't! It gets explained in the final chapter and that was beautiful. I got a flutter in my heart because of the explanation, I liked the aspect. The cover actually adds something to the story right now! Hidden message: Be yourself, make your own choices and live with the day. The hidden messages in this story are great. I feel like this could be a book for people struggling with choices in life. Transformation: I like the transformation Lance is undergoing in this book. He's so awesome the last few chapters, I like him a lot like that. I hope he'll stay that way!! Kept wandering off: Like I said before; I kept wandering off. It was hard at some parts to keep reading and I wasn't that excited to pick up the book again. The last few chapters added something and made me more at peace with the book. If you like contemporary, I think this is a book for you. This book has such beautiful life lessons and you go on a trip with someone who is getting to know himself. Lance is finding himself and is starting to make his own choices. Finally he is enjoying his freedom. That was the most exciting part about the book for me. "Stories matter. The stories we tell about each other. The stories you end up telling yourself." "Are you having a midlife crisis?" Miriam asked. "I know. But you've always been advanced." "A thought-provoking, hilarious, eloquent story of a young man realizing that the world is much larger than the one set up for him." What's your opinion on contemporary books? !